On Wednesday May 11th, Fulham and Atletico Madrid will play in the Europa League final. 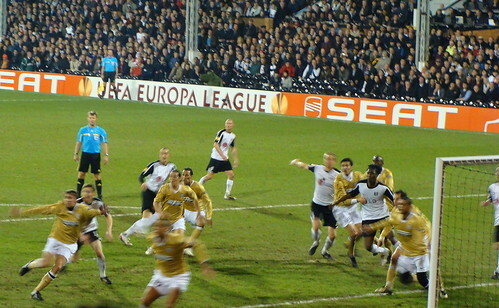 The tournament was referred to as the UEFA Cup in previous years, but in its first year of existence the Europa League Cup will be played in the HSH Nordbank Arena in Hamburg, Germany. The winner of the match will have the opportunity to play in a super cup match this August with the winner of the Champions League in Monaco. And although this isn’t the Champions League final, I still think it has to be considered a huge Cup none the less. After all Fulham beat Italian squad Juventus and German squad’s Wolfsburg and Hamburg to advance to the final and Atletico Madrid beat Turkish giant Galatasray, Portugal club Sporting CP, domestic league rivals Valencia, and EPL’s Liverpool to advance to the final following that early exit from the Champions League. And although both squads have had their fair share of disappointments this season in league play, a win in a global Cup can change the outlook of a frustrated organization in an instant. Fulham only has 2 wins in their last 10 league matches, while Atletico Madrid has dropped 6 matches out of their last 16 with only 5 wins over the stretch. So in other words neither team has lit it up this year in their respected domestic leagues. But a win in the Europa League final means that much more to team’s that have struggled this season. It is the easiest way a middle of the pack team can put a positive twist on the end of their season. And that alone makes it pretty cool.